Prospects for non-EU wood furniture suppliers selling into the EU are mixed. All suppliers face an uphill struggle to compete with EU domestic manufacturers. Added to this challenge this year is the economic uncertainty inside the EU and the prospects for further weakening of European currencies against the US dollar. Gains are being made by some external suppliers, but nearly all are in countries neighbouring the EU. Only one tropical wood furniture supplier, India, is currently making ground in the EU market. After a brief upturn in 2017, EU wood furniture imports from China, by far the largest external supplier, fell 3% to €3.09 billion in 2018. China’s competitiveness in the EU wood furniture market has been impeded as prices have risen on the back of growing domestic demand and new laws for pollution control pollution in China. 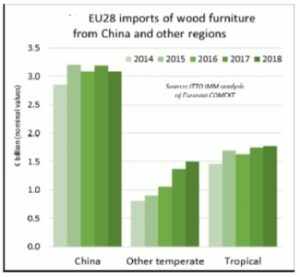 In 2018, EU imports of wood furniture continued to rise from other temperate countries, mainly bordering the EU. EU imports from these countries increased 9% to €1.49 billion in 2018, building on a 28% gain recorded the previous year. The biggest gains in 2018 were made by Ukraine, Belarus, Russia, USA, Bosnia, and Turkey. After a slow start to the year, EU imports of wood furniture from tropical countries picked up pace a little in the second half, and were €1.78 billion overall for 2018, up 2% compared to the previous year. 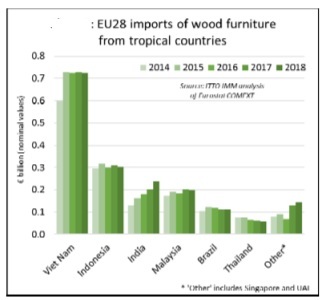 The main South East Asian supply countries have all followed a similar trajectory in the EU wood furniture market in the last two years. A rise in EU imports in 2017 was followed by a decline in 2018. After increasing 1% to €728 million in 2017, EU imports from Viet Nam fell 0.5% to €724 million in 2018. Imports from Indonesia increased 4% to €311 million in 2017 but fell back 2% to €304 million in 2018. Imports from Malaysia increased 10% to €203 million in 2017 and were 2% down at €199 million last year. In contrast, EU wood furniture imports from India continued to rise, up 18% to €239 million in 2018 after a 12% increase to €202 million in 2017. Imports from Brazil were €113 million in 2018, matching the 2017 level. 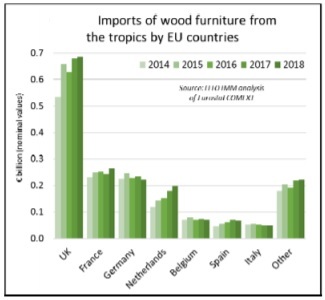 There were also shifts in the destinations for wood furniture imported into the EU from tropical countries in 2018. Imports in the UK, the largest market, were €687 million last year, 1% more than in 2017. There were also rising imports in France (+9% to €264 million) and Netherlands (+9% to €198 million). However, these gains in 2018 were offset by falling imports of tropical wood furniture in Germany (-6% to €220 million), Belgium (-2% to €72 million), Spain (-4% to €67 million), and Italy (-1% to €50 million).